Before using wiring tools for your bathroom, first time renovators should check with their local building inspectors prior to carrying out any electrical work in their home. 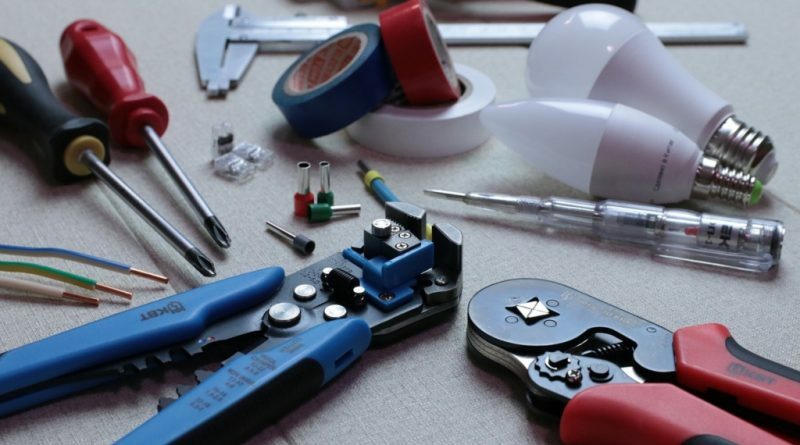 From voltage testers to wire cutting pliers, putting together a comprehensive kit of quality electrician’s tools will initially cost you less than if you hired a professional trade person to do the job. Installing electric wires in your bathing space can be a major home improvement task, but even unskilled homeowners can master the basics of connecting circuits with the proper tools and training. Often, the work takes only a few hours, and essentially even longer jobs can be accomplished over a free weekend. The type of electrical tools needed depends on the type of wirework and the exact problem in the facility. Before working on the circuits in your home, make sure that you really do have an electrical issue by identifying common symptoms of lighting system problems. A good piece of equipment to have is a multitester which tests your voltage and checks devices for electrical damage. You might notice that the lights in the bathroom flicker frequently. If a single wall scone flickers, try screwing the bulb tighter in the socket. If the problem relates to the system of electric distribution, you should notice multiple lights flickering. Take heart that most of the fixtures around your home operated by electricity can be fixed with the right instruments and some very basic washroom rewiring knowledge. Your lighting circuit problem might manifest itself in different ways. Instead of flickering, your ceiling lights might fail and not turn on or off when you flick the light switch. You might also notice a mild electric shock when you touch the button. An electrical shock indicates a serious problem with your room’s wiring and must be addressed immediately. A handy device to have on your electrician’s belt is a receptacle analyzer, this instrument indicates if a receptacle is grounded and polarized when plugging in your small appliances. Most newbie renovators forget to include this tool in their toolbox, but one of the things you typically need for an electric distribution project is a cutting device, such as a jig or circular saw. While these devices are not conventional electrician’s tools. In fact, they are needed to cut through the walls to gain access to the circuitry behind the drywall. A circular saw has a large round blade that cuts smoothly through different surfaces, while a jig saw has a flat blade, designed for cutting through flat surfaces. Both saws are appropriate for cutting through the walls in your home, as the blade is strong enough to penetrate the plaster, drywall and any wallpaper or decorations on the surface of the wall. When using a saw, be careful that you do not cut through the timber frame of your home. A stud finder lets you quickly locate the braces inside the walls, which give you an idea of the frame`s location. Cutting through the frame is dangerous because the frame serves as the base or foundation of the room. Try sketching directly on the walls, marking the location of each part of the frame, so you know what to avoid. Once you have access to the wires inside the walls, you need a test meter instrument. Most test meters have two cords that attach to a small box. When you connect the cords to the wires, the box indicates the level of current passing through the area. With this, you quickly identify any faulty wires, as well as those lines without any electrical current. Use the test meter and mark the faulty cables that it finds for replacement. After finding the bad wires, you must turn off the power to the restroom. Do not work on any circuits as long as current moves through the system, as you increase your risk of electrical shock. If you have a breaker system in your home, turn the switch off that powers the breaker for the washroom. Older homes typically have a fuse system, in which case you must remove the lavatory fuse, which turns off the power to that room. When working in a tight fitted electrical box or snipping off sheathing on nonmetallic cable, diagonal cutters are flexible gadgets that are perfect to maneuver within tight spaces. Another essential cutting implement to have are wire cutters (otherwise known as cutting pliers). These are a small electrician’s abrader necessary for cutting and removing any bad or faulty wires. Needle nose pliers and larger pliers have textured metal grips on the edges that form a tight bond when taking off the sheathing of wires. 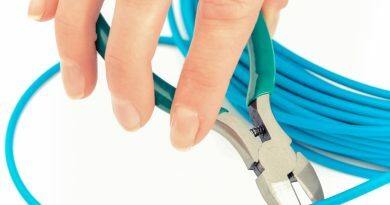 As a wiring tool, long-nose pliers can be used to bend filaments into loops prior to attaching them to electrical terminals. You also need wire connectors that effectively attach new lines to existing leads. Wire connectors are especially helpful if you want to add a new cable to a working system without completely rewiring the bathroom. Locate the end of the wires in the wall, where the faulty leads meet the main electrical line. Snip the end of the faulty wires and discard. Slide the connector on the end of the main line and twist the ends of that wire around the ends of your new wire using lineman’s pliers to wind the wires together. The wire connector keeps the new attachment covered and protected. When installing cover plates, one of the best utensils for the job is the rotary screwdriver which drives screws in quick and easy. 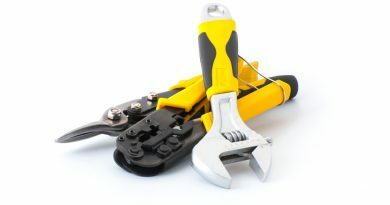 If you plan on working on more than one room in your home, then an electrician’s tool belt is a handy attachment to have on your main utility belt because it not only holds all your necessary appliances, but it also keeps your electrician’s instruments separate from your general tools for easy access. Some of the best tools to help you rewire your home are DeWalt power tools. The company makes dozens of machines suitable for home improvement and do-it-yourself projects. Once you finish wiring the bathroom, you must reattach the old drywall or install new drywall and plaster. An electric hammer or electric drill is perfect for gently pounding in the screws that keep the drywall firmly attached to the timber frame in the room. After covering the job, paint or wallpaper the repair and hide your work. ← Installing Cement Backer Board. Is it Worth the Hassle?